Avoid OSD (On-Screen-Display) messages that are not useful. Scalers designed for this purpose will suppress unnecessary messages from displays. Focusing on these top priorities will ensure that a presentation workplace will be something to look forward to rather than dread. Scott F. Menter, CTS, manager, Classroom Technology Services at University of Nevada, Las Vegas, drills-down on the use-case and programming when it comes to presentation switchers. “You need to look at your staff, their skill sets to support,” he said. Some presentation switchers are easier than others to program or configure, but some have more possibilities. “We standardized on the Creston DMPS-3 300 or 200 series switches,” he said. 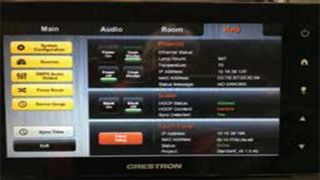 “Our programmer developed a program that addresses all the different scenarios that we encounter in our 165 classrooms.” The programmer configures the switcher from the Crestron touch panel, “[e .g.] adding mics, surround sound, number inputs, processor type, etc. This enable us to have preprogrammed processors and touch panels on the shelf ready to be deployed.”For more information and management tips, download our Tech Manager's Roadmap to Presentation Switchers.